the nonprotein component (the so-called prosthetic group) and the coloring matter of hemoglobin. Free heme readily oxidizes in air to hematin, in which the iron atom is trivalent. Many years of research on the structure of heme were rewarded by the synthesis in 1929 by H. Fischer of hemin, the hydrochloride of heme. 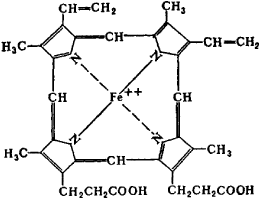 C34H32O4N4Fe An iron-protoporphyrin complex associated with each polypeptide unit of hemoglobin. Data analysis revealed that protein intake from haem animal origin was positively associated only with haemoglobin and haematocrit. Although irrelevant in this case, if there is the potential for significant blood loss, circulating haemoglobin levels should be rigidly maintained with transfusions, avoiding the risk of intra-operative stimulation of haem synthesis precipitating a porphyric crisis (1). Vitamin B6 is required for haem synthesis and therefore for erythropoiesis. The porphyrias are a heterogeneous group of inherited metabolic disorders associated with defects in haem biosynthesis. Primary acquired sideroblastic anaemia, which involves abnormal haematopoiesis, is idiopathic, as it is not clear what the cause of defective haem synthesis is in the abnormal erythroid clone (3) This type of sideroblastic anaemia is the one most commonly seen in the haematology laboratory, as it is part of the myelodysplastic syndromes--a series of clonal haematopoietic stem cell diseases. Haem iron is readily absorbed by the body whereas non-haem iron is less soluble in the gut and therefore less is absorbed. Iron supplementation--is it necessary for healthy pregnancy? Diets that are low in iron, high in inhibitors, with little haem iron intake, are the most common causes of iron deficiency. There are two types of iron in food: haem (found in red meat, chicken and fish and easily non-haem iron is found in leafy green veg such as spinach (above) and lentils (right) but is less easily absorbed into the body absorbed) and non-haem (found in plant foods, such as leafy green vegetables, cereals, beans and lentils and dairy products, and less easily absorbed). Could a lack of iron be making you exhausted? Serological tests for Venereal Disease Research Laboratory (VDRL), Trepanema pallidum haem agglutination (TPHA), Fluorescent trepanemal antibody (FTA abs), for Chlamydia trachomatis (Indirect immunoflourescence (IIF) were negative. 10 This occurs secondary to excess of succinylacetone and succinyl acetoacetate, which inhibits d-aminolevulinic acid dehydratase, first enzyme in haem biosynthesis.